Heat oil and butter in Presto® Electric Skillet at Warm until butter is melted. Add parsnips; cook at 350° for 5 minutes, stirring occasionally. 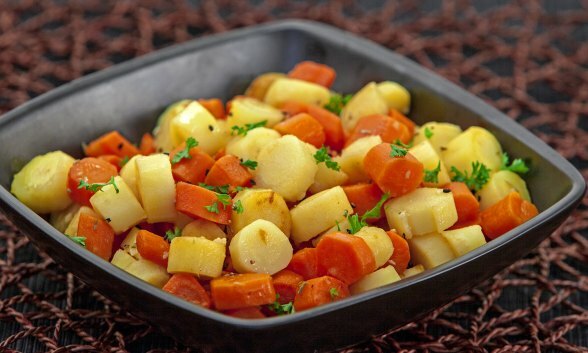 Add carrots; cook until parsnips and carrots are brown and almost tender, about 5 to 8 minutes, stirring occasionally. Add garlic; stir-fry 30 seconds. Reduce heat to 200°. Add broth and rosemary; simmer, covered, until vegetables are just tender, about 3 minutes. Uncover. Increase heat to 275°; boil until liquid is evaporated. Stir in lemon juice, parsley, and salt and pepper to taste.